Chaises are a great way to add an accent to your home that is both elegant and relaxing. Not only do these couture pieces blend with room settings that are already in existence, but they create a lasting comfort that is often unparalleled in other living room furniture. With a long single seat cushion, this chasie creates a comfortable laying space that sofas and loungers with multiple seat cushions simply can't offer. 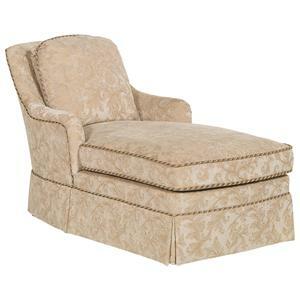 Matched in its comfort by a simply adorned elegance, this chaise features fine upholstered fabric met with gorgeous accent trim. 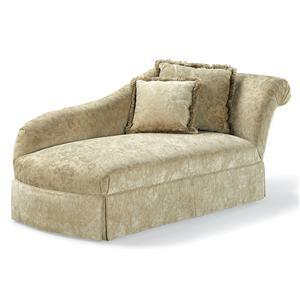 Creating an overall look that is stunning and alluring, this living room chaise will add an accent to your home. 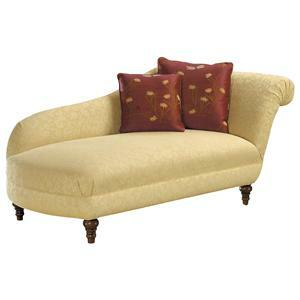 The Sofa Accents Traditional Trimmed Chaise by Fairfield at Stuckey Furniture in the Mt. Pleasant and Stuckey, South Carolina area. Product availability may vary. Contact us for the most current availability on this product. Wood & Finish Available in over 25 finishes in the following groups: Premium Plus Finishes, Premium Finishes and Standard Finishes. Since differences in wood grain affect the finish, it is not possible to guarantee an exact match between two pieces of furniture. A certain degree of variation should be expected. Frame Construction To maximize strength and durability, frames are constructed of solid kiln dried hard woods and laminated hard wood veneers. Many major stress joints feature both triple doweling and corner blocks that are attached with glue, staples and four screws. To insure frame integrity and compatibility with style and design requirements, frames are engineered to use a variety of joint constructions. All solid hardwood is dried to 6%-8% moisture content. Seat Support The Soft-Luxe individually pocketed spring system is the latest design innovation in upholstered furniture engineered to provide the ultimate in comfort. The Soft-Luxe system features a minimum of 100 coils per seat, or a minimum of 300 coils per sofa. Each seat cushion has a separate coil suspension that eliminates "roll-together" and provides seating comfort for every individual regardless of shape or size. The Soft-Luxe seating system will provide years of durable and carefree service to even the most active families. Some frame styles use drop in coil units or sinuous wire springs. From the earliest of times, individuals and families have sought out a way to decorate their homes, providing means of function as well as glamor and sophistication. With the introduction of accent furniture, homeowners were given a way to proudly display their own tastes and styles through single piece collections that "accent" the look of an entire room. These unique furniture pieces can range in style from the most modern of designs to the richest upholstery. With an array of varying accent styles, colors and designs, the living room furniture from this collection can be easily added to a variety of existing room settings, or be combined with other pieces from the group to create a truly alluring eclectic furniture look. From modern, straight-lined loveseats in solid colored fabrics to traditional settees with cabriole feet, this collection has everything you need to complete a lavish, eye-catching collection. The Sofa Accents collection is a great option if you are looking for Traditional furniture in the Mt. Pleasant and Stuckey, South Carolina area. Browse other items in the Sofa Accents collection from Stuckey Furniture in the Mt. Pleasant and Stuckey, South Carolina area.